WHAT AN INCREDIBLE FIND! AS YOU MAY KNOW IT WAS A VERY DIFFICULT TASK TO GET MEN TO JOIN THE ROYAL NAVY IN THE 1700`S, SINCE THE CONDITIONS WERE SO TERRIBLE, AND THE SURVIVAL RATE , EVEN WITHOUT SEEING ACTION, WAS VERY POOR. IT WAS THE PRACTICE OF THE DAY TO GO INTO THE TAVERNS(PUBS) AND GET MEN TO TAKE “THE KING`S SHILLING” A SILVER COIN AND BY DOING SO JOINING UP BY DEFAULT!!!! SO MEN IN BARS WOULD NOT TAKE THE COIN EASILY! SO DECEPTION WAS NEEDED, THUS THE COIN WAS SLIPPED INTO THE DRINK AND ONLY WHEN IT WAS FINISHED WAS THE COIN SEEN……TOO LATE……. 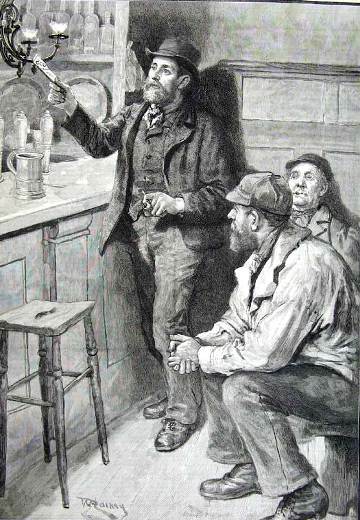 SO TO STOP THIS PRACTICE MEN WOULD CARRY THEIR OWN MUGS INTO TAVERNS AND THIS IS WHERE THE GLASS BOTTOMS CAME INTO THEIR OWN….NO MATER HOW FROTHY THE BEER OR HOW DARKLY IT WAS BREWED THE SHILLING WOULD SINK TO THE BOTTOM AND BE SEEN!!!! ……THIS IS A VERY RARE SURVIVOUR (SIC) OF THIS PERIOD. THE “TOUCH MARKS ” (LIKE SILVER MARK EQUIVALENTS) GIVE THE DATE.AND AS YOU CAN SEE FROM THE AGED PAPER TAG ON THE BASE THIS HAS COME FROM A VERY KNOWLEDGEABLE EARLY COLLECTION. 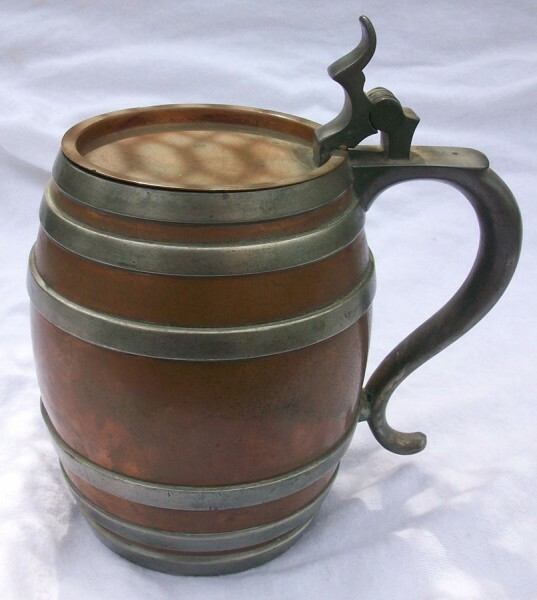 THESE MUGS WERE ONLY PRODUCED IN THE EARLY 1800`S (REF; ARTHUR NEGUS GUIDE TO PEWTER,COPPER AND BRASS PAGE 76) AND LATER IN MID VICTORIAN TIMES AS “FUN ITEMS” AS YOU SEE THE HANDLE HAS SUFFERED A HOLE BUT IT IS STILL STRUCTIONALLY (SIC) WHOLE. AS I SAID AT THE BEGINNING THIS IS A RARE CHANCE TO OWN A PIECE OF HISTORY THAT CAN ONLY COME UP OUT OF VERY RARE COLLECTIONS OR MORE COMMONLY ONLY FOUND IN MUSEUMS……..YOU MUST HAVE ONE BID. 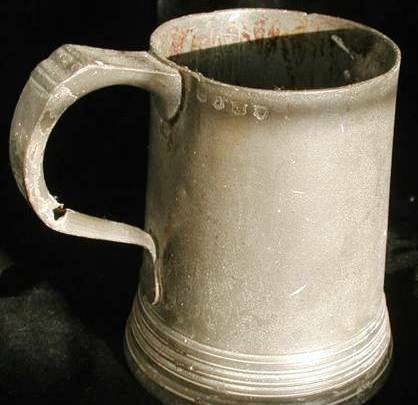 It’s amazing how a simple question as: “Why did Glass-Bottom Tankards originate?” can lead down a path of unexpected discovery. An Internet search quickly confirmed that there are at least three popular explanations for its development. [Another editor’s note: This theory was also promoted by the well know collector and SCI Master Steinologist, Col. John Ey (Ret.) in an early edition of PROSIT. ] In reviewing that article, I immediately thought this to be a bit suspicious, so I got out one of my glass bottom mugs and held it up to my mouth and you know what? One CAN NOT see down the drum of the mug! Therefore I could NOT see anyone approaching me! There was no need for a glass bottom at all – at least not for this proposed reason! 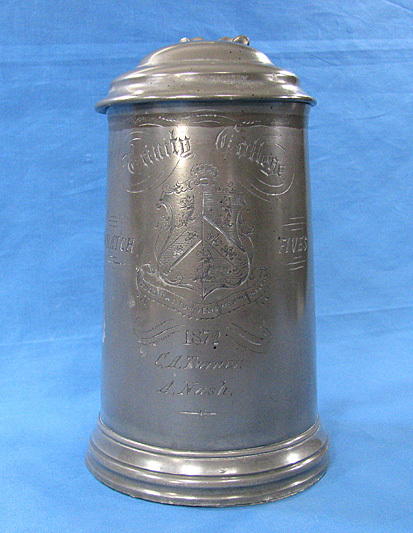 James Dixon (later James Dixon and Sons) started selling these “quart” and “pint” sized glass bottom tankards in / about the year “1865”; at least that is the earliest date I have seen on one to date, and that on a two handled mug engraved for the Royal Engineer Yacht Club. This design above was very popular, and Dixon (and others) made 1000’s of them over many years. 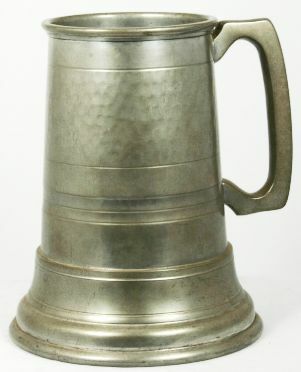 Above: pewter gambling / wager mug with 5 dice. 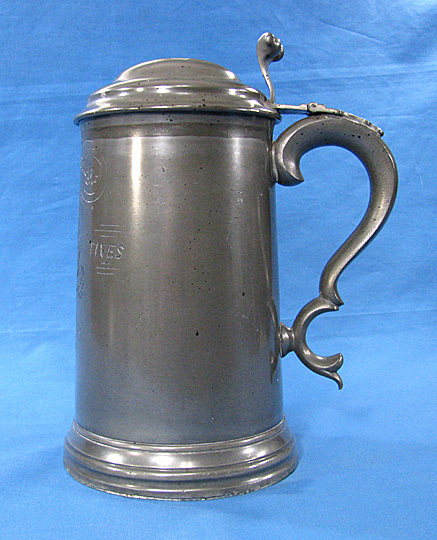 The style with the squared handle dates to the late 1800.s. This one is much “newer. 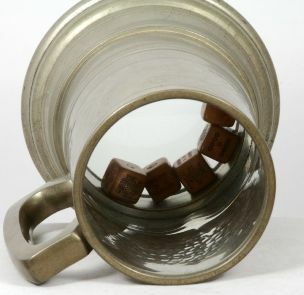 It was a gambling / wager mug (as shown above) only through the years beer has seeped into the open space that held the three dice. As it was from a very historic English regiment I felt I owed it to the world to try to fix it up. So very carefully I wedged up the bottom pewter rim that was holding the glass in place with a very small flat headed screw driver, and lots of patience. One out i could clean all the surfaces of the two round glass panels. Interestingly the three dice were made of wood and not bone. . I oiled them up, after I refurbished the dots with some new black paint. Then after that I blew dry the dice until very dry so no oil would be on the inside on any of.the glass, then I repeated the process. I put the dried dice back in and then used my favorite “Smith-tool”, a wooden crab mallet [!] , the long stem end, to push the pewter rim back in place . If one looks real close they now might be able to tell it was repaired but the dice and the glass are nice and dry and clear now. The Wiltshire Regiment (Duke of Edinburgh’s) was an infantry regiment of the line in the British Army, formed in 1881 by the amalgamation of the 62nd (Wiltshire) Regiment of Foot and the 99th Duke of Edinburgh’s (Lanarkshire) Regiment of Foot. 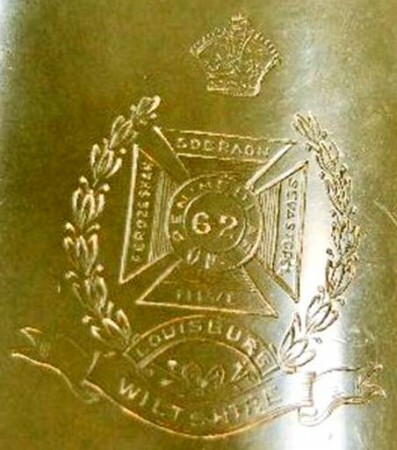 After service in the First and Second World Wars, it was amalgamated into The Duke of Edinburgh’s Royal Regiment (Berkshire and Wiltshire) in 1959. Following further mergers, the regiment’s lineage is today continued by The Rifles. The loss of a glass bottom or a severe crack is a most common occurrence! 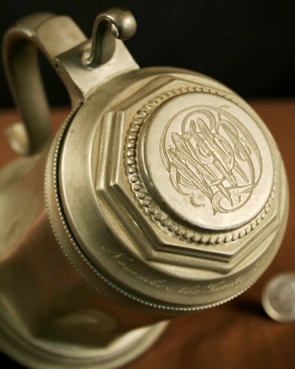 Unless the stein / tankard is named to someone real important to you the owner, (I hate to say this but) throw the damn thing away ~ or give it to someone you do not like! It will not be worth the expense to fix it. Even finding someone that can cut a correct sized circle of glass now-a-days is almost impossible. Shown above ▲. Newer style pewter glass bottomed stein. Circa 1920- 40. 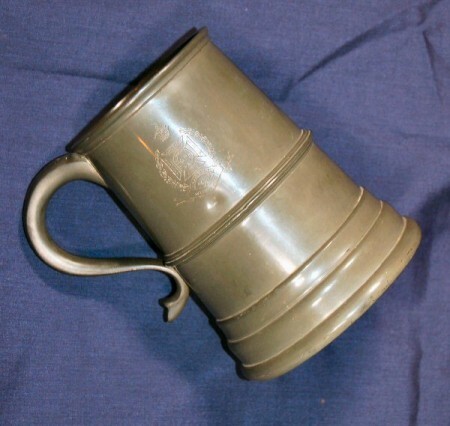 American copper stein with pewter bands and a glass bottom. Circa 1910 -30. One can visually tell it is American from the elongated flat section on the top of the handle and the twisted “shoe horn” thumblift. The maker is probably Manning Bowman. 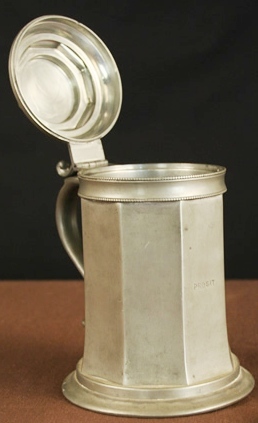 Used as a gag present most often, this English made pewter mug is very new. 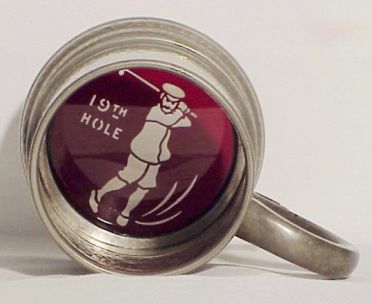 For the non golfer it refers to the “19th hole” which is the pub house where liquid refreshments after a really rough game of golf would be welcomed. I just spent some time on your website and was very impressed. I have a (hopefully) quick question that I couldn’t find the answer to…maybe you can point me in the right direction. My mother recently gave me several pewter steins with glass bottoms that belonged to my dad. I’d like to give them to my son for Christmas but they leak a little bit. Is there anything I can use to seal the leak? I’m sure they aren’t valuable (except to my son who loved his grandpa and would like to use them now that he’s become a beer connoisseur) so I’m not worried about hurting them, I just want them useable again. Hello Sue and thank you for writing. Is there anything I can use to seal the leak? 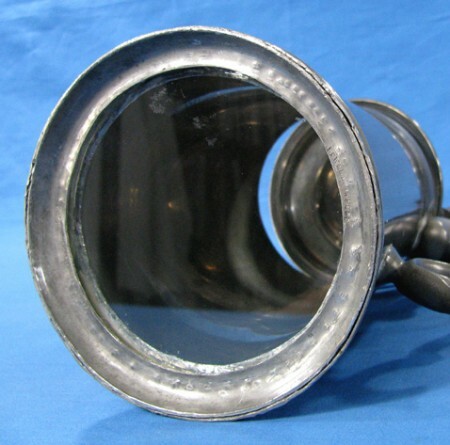 The bottom glass was usually secured by use of a tiny bit of ceramic sealer around the edge of the glass and the bottom pewter supporting ring, which over time dries out and contracts. Without seeing the pieces I would recommend as a first step that you buy some “Hard as Nails” (clear) nail polish. Fill up your pieces with water and try marking where exactly the leak is coming from. Use a small felt tip black / blue marker . Put a tiny arrow ( →) on the glass to the spot. If the leak is the whole outside of the glass bottom, then you might have a bigger problem than I think. However the same instructions should apply, just use more polish. Try getting your fingers and the applicator down INSIDE the mug / stein and coat where the leak is / leaks are. If leaking all around it mean the original ceramic sealer had deteriorated, then like I said, you will have to do the whole thing. Let polish dry for about an hour. 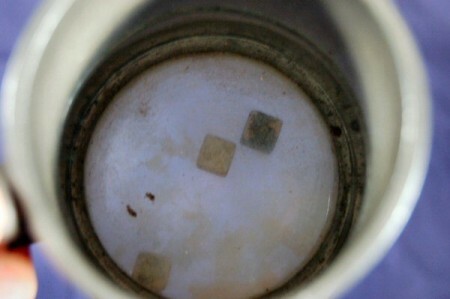 Fill the piece up and test for leak again by placing mug / stein on a paper towel. If doing the polish application on the inside doesn’t work the first time, try again! If that second application still doesn’t work then try putting some on the bottom outside. The reason you don’t want to do this first is that while the polish dries clear it is slightly visible and if the mug/ stein has any value at all that woud distract from it. Doing it on the inside, it is nowhere as visible. I have has great success using this method, even with antique silver pieces that had sustantial punctures. Please let me know how thing go for you …….and good luck and a steady hand! I finally got around to sealing my steins. My had wasn’t as steady as I would have liked but 3 of them now hold water (and in the near future beer)! I’m putting a 3rd coat on the one that still leaks. They were very leaky and I just eventually sealed them with the polish all the way around the inside and the outside. You can see the polish a little but since the only value is sentimental I’m sure my son won’t mind.